Menzel performing at the U.S. Capitol in May 2008. 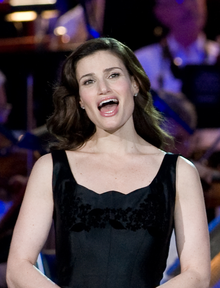 Idina Kim Menzel (born Idina Kim Mentzel; May 30, 1971), is an American actress, songwriter, and singer. Menzel was born Idina Kim Mentzel in Long Island, New York. She changed her name to make it simpler. Her parents divorced when she was young. As a kid her favorite songs were Tomorrow and The Way We Were. Menzel went to New York University's Tisch School of the Arts. She was a wedding singer until 1995. In 1996, Menzel played Maureen Johnson in the Broadway show Rent. She played that role through 1997. She was nominated for a Tony Award for the show. In 1998, Menzel released her album, Still I Can't Be Still. She did a month-long tour to promote it. Eighteen thousand copies were sold. She also played Circe in an episode of Hercules: The Animated Series. In 2000, Menzel played Kate in the off-Broadway show The Wild Party. She was nominated for a Drama Desk Award and a Drama League Award. In 2001, she played Dorothy in Summer of '42 off-Broadway and Sheila in Hair at New York City Center Encores! Menzel is known for her role as Elsa the Snow Queen in the 2013 movie Frozen. She is also known for her role as Elphaba in the original Broadway production of Wicked, for which she won a Tony Award in 2004. Other notable roles include Maureen Johnson in the original Broadway production of Rent and in the movie based on the play, Shelby Cororan in Glee, and Nancy Tremaine in Disney's Enchanted. Menzel appeared in the Broadway show If/Then. For her role in that show, she was nominated for a Tony Award. Menzel was born in Queens, New York. ↑ "Idina Menzel: Streisand, Hamlisch and me". The Jewish Chronicle. Retrieved 2014-06-29. This page was last changed on 29 November 2018, at 11:57.